Before moving forward, I want to apologize for my lack of posting over the last year. To say I have been inactive would be a massive understatement. Life has been crazy and, I must admit, it has not all been a good kind of crazy. Not at all. That being said, I am blessed. I hope to be getting back to blogging on an, at least, semi-regular basis starting right now. While life has been crazy, part of my exile has been self-imposed. I am still heavily involved with the NAWAC and much has been going on with the organization. I feel strongly we are closer than ever to making some ground-breaking discoveries. Also, what free time I have had left after job, family and NAWAC obligations has been eaten up by my book project. I am writing a book on the black panther phenomenon in Texas and the American South. While there is much work left to do – it is tough writing in fits and spurts - I am beginning to see the light at the end of the tunnel. I am hoping to complete the book this summer but much of the heavy lifting has been done already and I should be able to give the blog the attention it deserves. So, thank you for sticking with me. I really appreciate it. Now, on to the subject at hand: black panther sightings. Following are the latest reports submitted to me by fellow Texans who claim to have encountered large, black, long-tailed cats matching the classic description of a “black panther.” As I have stated here numerous times, there is not supposed to be any such animal. Despite this fact, Texans, and other people across the American South, continue to report sightings of these enigmatic felines. Before we go any farther, numerous people have posted comments to previous posts on this topic claiming to have photos of these mystery cats. It is true that photos cannot be attached to comments; however, pictures can be emailed directly to me at Texascryptidhunter@yahoo.com. This email address can also be found in the right margin of the blog site. PLEASE, if you have photos or videos, attach them to an email and send them to this address. If you are leaving a comment on another post and would like for me to contact you directly, contact information will have to be included in the comment you leave, as I cannot respond directly to said comments. TCH Comment: This is an interesting account and the claim of video evidence is intriguing; however, no video accompanied the report. Justice, if you see this post, please email me a copy of the video. I would love to inspect it. If it is too large to email, contact me at Texascryptidhunter@yahoo.com and we can make arrangements for a different type of file transfer. I will hold off on adding this report to my black panther distribution map until I can get a look at that video. TCH Comment: Mount Calm is a small town of approximately 320 people in Hill County. For the most part, the county is rural and farming and ranching dominate the economy. With only about 35,000 people in an county encompassing 986 square miles, there is plenty of room for a big cat to pass through or stay for long periods of time undiscovered. 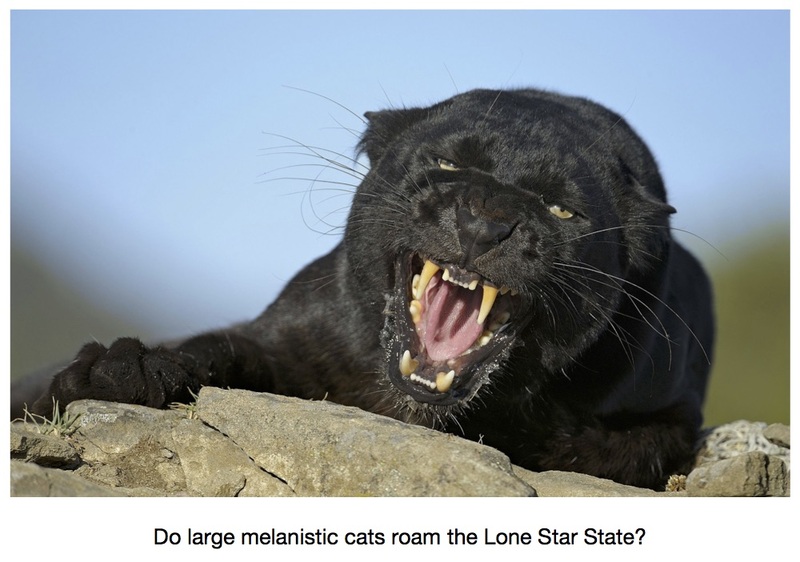 Hill County has also been the origin of several other reports of large black cats over the last several years. I really do not find any reason not to believe this witness and will add the sighting to my distribution map. TCH Comment: This report seems too good to be true but I have had other reports of multiple cats running together that I found to be credible. I would, however, like to hear more about this sighting and, if possible, speak to not only Edmundo but his son who also saw the cats. I will hold off on placing this sighting on my distribution map until, and unless, I hear back from Edmundo. TCH Comment: Granbury serves as the county seat of Hood County which has a population of only 41,000 people (98 per square mile) as of the 2000 census. The county sits just south of the Fort Worth half of the ever expanding D-FW Metroplex but retains much of its rural character once away from the I-35 W corridor. There has been at least one credible sighting of a large, black, long-tailed cat just north of Grandview outside of Alvarado. I find the description of the animal as “marble-colored” interesting. 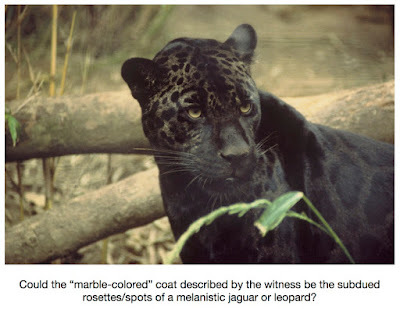 The witness admits this could have been an illusion created by light conditions but could it not also be a result of spots/rosettes being visible under a black coat as is seen in melanistic jaguars? If the witness is accurate with their description of size this is clearly no house cat. Likewise, if the witness is accurate and he was only 20-feet from the animal there should be no reason to think he mistook a dog for a cat. I will be adding this report to my distribution map. TCH Comment: At first glance this area seems to be a highly unlikely area for a big cat sighting of any kind. I will admit my first instinct was to put this one down as a case of mistaken identity and move on. I recalled, however, that I had a sighting reported to me from the same general area not too long prior to receiving Jon’s account. I filed that one away as a misidentification and never even mentioned it on the site. Maybe I was too hasty. Upon close inspection of the area, Brushy Creek runs just south of Old Settlers Park back to the east/northeast until it meets up with the San Gabriel River. There is a dense greenbelt that runs along the creek all the way out of Round Rock. Once out of town, the area east of Round Rock becomes extremely rural and lightly populated very quickly. I feel it is not outside of the realm of possibility that Jon saw exactly what he claims he saw. His description of an animal with a very long body and long tail that leapt into a tree certainly proves, if nothing else, that this was no dog. The reaction of the park ranger rings true to me as well. I am going to place this sighting on my distribution map despite the urban location of the event. The fact that two people in that immediate area reported seeing a ‘panther’ just weeks apart tells me something might have been going on in Old Settlers Park back in February. TCH Comment: Centerville sits in Leon County in what is generally considered the easternmost portions of central Texas. The area just to the east of Centerville has yielded multiple reports of large black cats. The report is consistent with those I have heard from others in the area. I will be adding the sighitng to my distribution map. Brandon, if you see this, you are correct, I am only an hour west of you. I would love to sit down and talk to you and your folks about your sightings. If you are interested, email me at Texascryptidhunter@yahoo.com. TCH Comment: Rio Medina is an unincorporated community in Medina County, Texas. The community sits adjacent to the Medina River. The county encompasses 1,335 square miles and has a population density, as of the 2000 census, of only 30 people per square mile. To say there is not much going on out this area would be an understatement. It is a rugged and arid area that is sparsely populated and in which a big cat should be able to thrive and remain undetected. The sighting report itself is very believable and mirrors what has been reported by many others. The area just west of San Antonio has yielded numerous sightings of large, black, long-tailed cats over the last several years. I will be adding this sighting to my distribution map. Reports of these large, black, long-tailed cats continue to flow in to my inbox on a regular basis. I strongly believe that people are seeing a living animal. Please continue to forward reports of sightings to me at Texascryptidhunter@yahoo.com. You never know, yours might be the report that breaks this mystery wide open. *If you would care to peruse the interactive black panther sighting distribution map, click here. Once you can view the map, click on individual pins to read a brief synopsis of what was reported at the location. *ANNOUNCEMENT/REMINDER* - Just a reminder that posting, emailing or tweeting me photos is granting me permission to publish them in any one of multiple formats (Facebook, Twitter, Book, Magazine, etc.). Proper photo credit will be given whenever possible. If you wish to share a photo with me but do not want it published, state that and I will certainly honor your request.